Dimensions: 1220 mm x 3600 mm. We are one of the leading manufacturers of a range of Metal Roofing Sheets. We are supplied using high quality Al - Zn alloy Coated steel and Pre painted Galvanized steel sheets, In general three grades of steel are used for roof and wall cladding applications, which are 550 MPA, 345. MPA and 240 MPA. In general 550 MPA materials are called "High Tensile Steel". Being a quality-oriented enterprise, we are engaged in manufacturing and supplying a broad gamut of Metal Roofing Sheet. For our valued patrons, we have introduced Industrial Aluminum Roof Sheets, designed and made in conformity with the accepted industry norms. Eco Infra Developers Pvt. 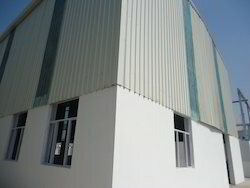 Ltd.
We are providing a premium quality range of Standing Seam Sheet. These roof sheets are fixed to the structure without punching the sheet with the help of specially designed seam clips. 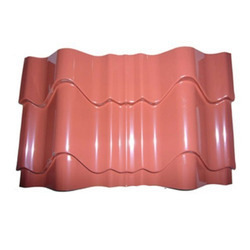 We offer Hi Rib roofing system that is extensively used for roofing of buildings. Our roofing sheets are environment friendly, cost effective provides complete roofing safeguards. Made from premium raw materials and based on most scientific technology our Hi Ribs offer best top covers for buildings.